I have to admit I haven’t gotten too homesick since we have been here. Wherever Lindsay is feels like home to me. But it is the weekend of her’s and my favorite race in the whole world and we are on the other side of the world. People are certainly still crossing the finish line of the Asheville Citizen Times Half-Marathon as I write this and it makes me sick to think that I cannot be there to see everyone in the Asheville running community. When I ran this race for the first time in 2002 it was the longest one I had ever done. You roll through the nicest neighborhoods in Asheville up and down the hills of my favorite city in the world. I always tried to run it hard. A few years later in 2004, I crossed the finish line and promptly threw up on the shoes of the male winner, Elly Rono, while he was being interviewed by the paper. “You weren’t suppose to see that,” I said to him as the reporter gagged at the sight of me, “sorry.” Last year, Lindsay ran as a mobile journalist interviewing people as she ran. Around Asheville she was a celebrity. Everyone loved “Mojo,” the mobile journalist Lindsay. We loved everything about it, especially the socializing at the end. Though we are sad, we are planning to travel in mid-October to Daegu just northeast of here to run a half-marathon. We are hoping it will itch our scratch to be around other runners. We have heard that the races here are pretty special. A big ole party at the finish, Korean style. Beside for keeping with our training, Lindsay and I have made it a goal to learn as much of the Korean language as possible. Though our vice principal forbade learning the language while mingling with other foreigners, we decided to go ahead and do it anyway. The whole experience has been a treat. Last night we had dinner with one of the girls from our class and her boyfriend and today we went to lunch with several of people from class. I am sure our vice principal would be shocked to hear that we didn’t get drunk. I make fun of her paranoia a little, but I guess I have to remember that the Western world does bring some undesirables to the proverbial Eastern table. But we are also learning a whole lot about the Korean language. It has been like my cousin described law school, “drinking water from a fire hydrant.” We have been moving fast and since Lindsay and I just arrived we sometimes have no idea what is going on. But for help and in a moment of teacher laziness, I decided I was going to have my seventh period teach me their names in Korean. This last class is an extra class for both me and the students. I have 5 fourth graders that I am absolutely crazy about. 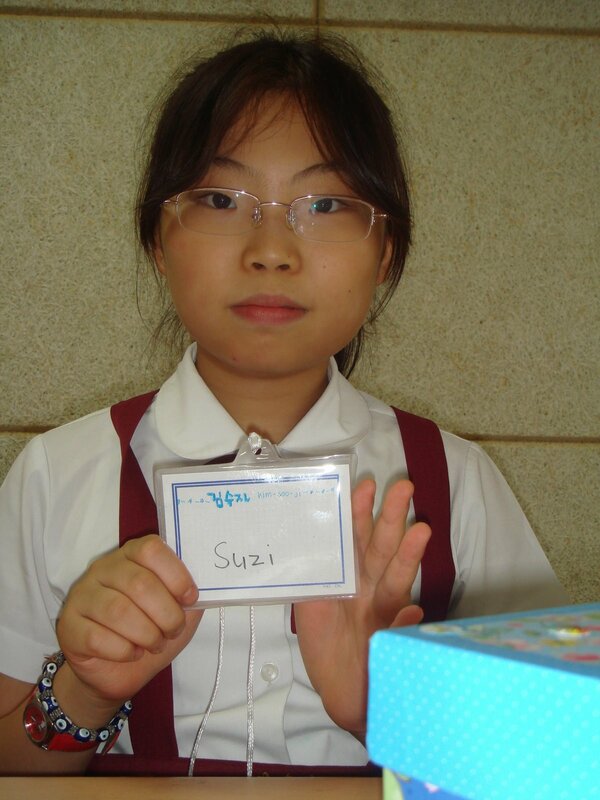 To the right is Su-ji, one of my best and most pleasant students. They try so hard and actually have a pretty good command of the language. They are also so eager to please. To my surprise this exercise actually worked well. They had to explain to me how their names sounded by speaking English. But they laughed at me as I tried to pronounce their names. “Jeoung-Heong,” I said to one boy in class….”Teacher, NO” he said “It’s JEOUNG-Heong!” “Oh,” I said wondering what I had done wrong. I figured out in class today that sometimes it is all about emphasis, and for young Jeoung-Heong I simply did not emphasize his name enough. Oh well, I am sure that I will have them teach class for me again soon….I’ll learn. It is amazing how much we can learn from those we teach (and students love getting a chance to teach their teachers! ).I had a not-so-successful race in Asheville this morning, but it made for a good story, so I thought you might enjoy reading it. I wrote about it on my blog this morning at asortofnotebook.blogspot.com.